The following is where I currently am as I process a theology of failure. I undoubtedly will write some aspects of this incorrectly, if not many! But, I’m still going to take a shot at writing my thoughts.. which is also the largest point of this post. In so many cases, success is not the primary criteria to judge accomplishment by – but rather the effort we exert towards a calling and the resolve to continue moving forward regardless of how others, or even we ourselves, would view the end result. I’ve had more cuts and bruises than I can count. Literally. And figuratively. We live in an injury prone world where we’re set up to fail from the start. We are told early in life that we have to compete to be seen, we have to take risks but are only rewarded for success, and if we want to make it we can only trust ourselves. Not only that, but temptation lurks around every corner and yet we are told by the world we have to always have it together, portray the perfect life, and swear ourselves to secrecy for every misstep. As I write these thoughts that I think a lot of us have, I feel burdened that we speak much of the importance of success, but little of the failure it takes to get there. We’ll if that’s the case for the author of 23% of the New Testament – I think he must have had an understanding of failure that I want to grasp. Outside of discussing the failure that can come from temptation – we see much a-moral failure. Places where goals or places we feel called are temporarily blocked, rerouted or completely destroyed. We all love stories and movies about people who experience failure or strife and keep on fighting forward – but when it comes to our own lives, we find it almost impossible to pull away from our minute-by-minute lives to see the larger picture. We see repeated failure and challenge in the life of King David in relationships with friends, people he led, women he loved and leaders in his life. Some due to sin, but most because of circumstances far outside of his control. In many situations he was doing the right things and still hit walls – relationships ended, goals were blocked or he ended up hiding in a cave again. Yet we attribute David with incredible success! Why? Because he never gave up. He faced down adversaries and continued on. He sought to always seek the Lord and follow His instructions. He gave honor where honor was due, even when it wasn’t earned. He was a man after God’s own heart. “Failure is not the opposite of success, it’s part of success.”2 He was a man who continued risking failure for the adventure he was called to. It is of immense importance that every person develop a strong theology of failure. One that is backed by the grace and truth we see in The Word, or we end up risking less and taking easy routes. Where would we be if David had seen the Lion or the Bear and hid behind the nearest rock instead of risking failure? If you’re like me, I need constant runs to Walgreens for more bandaids. I’ve experienced more failure in all kinds of ways and struggles than I’d like to admit, but I’m not giving up. From greed to dealing with an addictive personality, I’m thankful I have friends, pastors and mentors around me that know me, have walked with me for years and stand along side me as we continue on together, not giving up. Where are you today? Are you searching for where you stashed your bandaids? Are you staring down your next challenge? 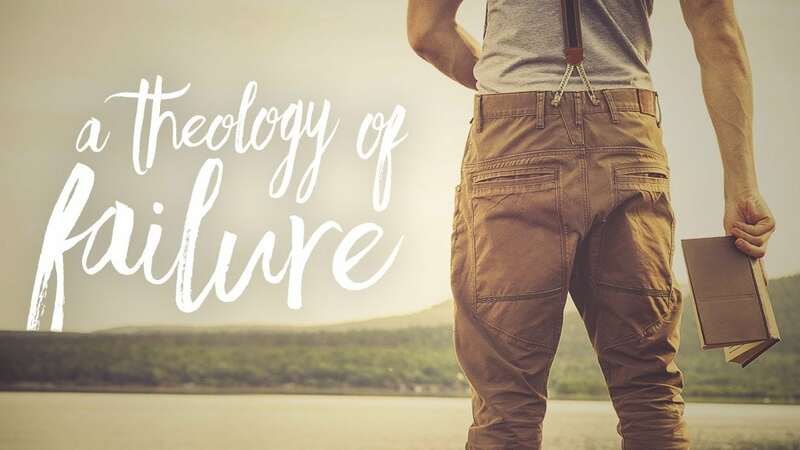 How can developing a deeper theology of failure effect you where you are today? 2 Corinthians 4:9 We are persecuted, but God does not leave us. We are hurt sometimes, but we are not destroyed. Psalm 40:2-3 He drew me up from the pit of destruction, out of the miry bog, and set my feet upon a rock, making my steps secure. He put a new song in my mouth, a song of praise to our God. Many will see and fear, and put their trust in the Lord. Jeremiah 8:4 Jeremiah, say this to the people of Judah: ‘This is what the Lord says: “‘You know if a man falls down, he gets up again. And if a man goes the wrong way, he turns around and comes back.